S.A.D. 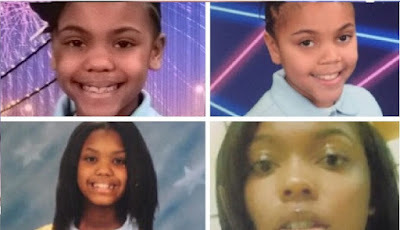 Party 2017 will raise money for Planned Parenthoo. From Monday, March 20th to Thursday, March 30th, diners can enjoy great deals at 90 Brooklyn restaurants. 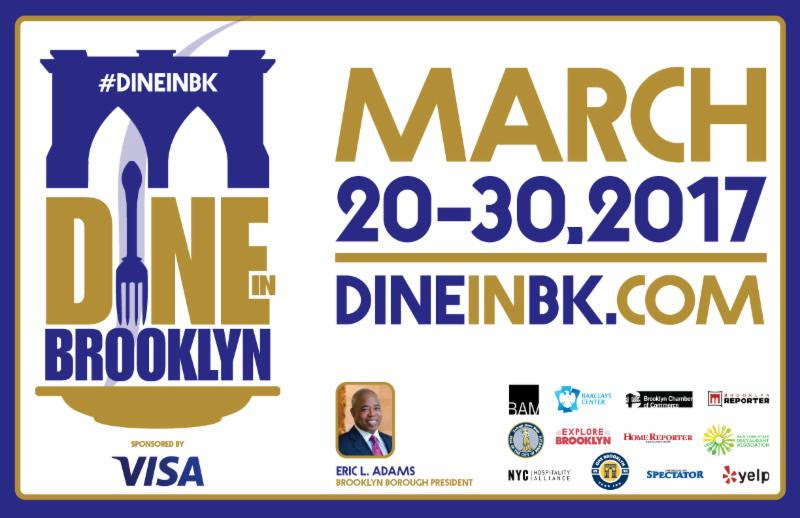 Dine In Brooklyn offers three-course dinners for $28, two-course lunches for $15, and weekend brunches for $12. 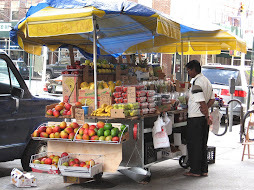 Some noted restaurants are participating this year, including Friend of a Farmer in Brooklyn Heights, Chez Oskar in Bedford-Stuyvesant, La Palina in Bensonhurst, BKW by Brooklyn Winery in Crown Heights, Boqueria in Fort Green and many more. Go to the restaurant page to find your newest favorite by location, style or number of views. Hahaha we just saw this one. 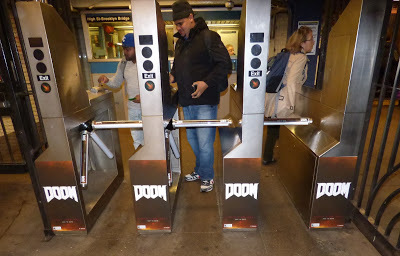 The MTA’s MetroCard fare hike kicks in this Sunday, March 19th. The fare for a single ride will remain $2.75 ... but weekly and monthly MetroCards will see increases. - A 7-day pass will increase from $31 to $32. - A 30-day pass goes from $116.50 to $121. 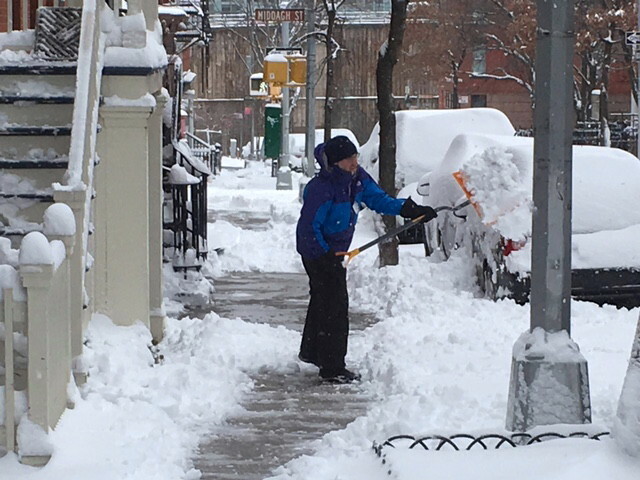 Due to winter storm Stella and the blizzard, Mayor Bill de Blasio issued Emergency Executive Order 92, placing NYC in a State of Emergency as of midnight Monday night. This order means people have to stay off the roads until midnight Tuesday (or longer) and use public transportation whenever possible. Those who must drive due to an emergency must exercise extreme caution. Vehicles blocking snow plows will be towed. 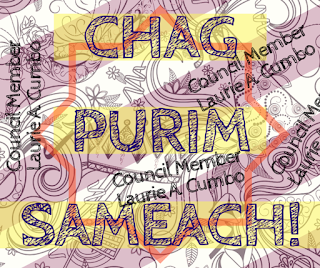 For more on what's closed and what's open, visit NYC.gov. 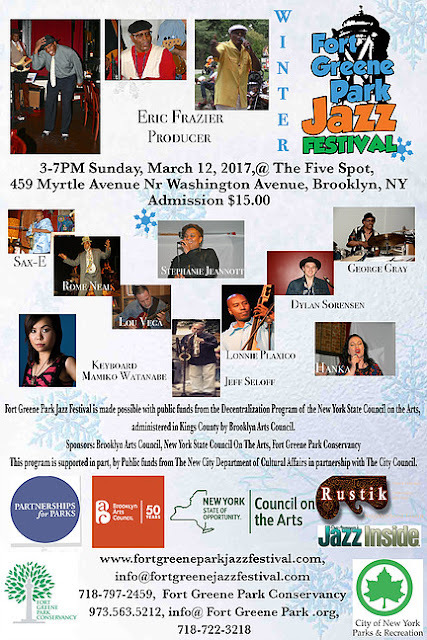 NYC Council Member Laurie Cumbo sent out an eblast announcing that some events have been cancelled because of the expected blizzard, part of incoming Winter Storm Stella. No doubt more events will be cancelled as the day goes on. If you are short of food, beer, cash, toilet paper, meds or any of the necessities of life, Monday would be a great time to pick them up. NYC Emergency Management is advising everyone in the NYC area to prepare for a nor'easter*, forecast to bring cold temperatures, 12-18 inches of snow, and winds of 20-30mph with gusts up to 50mph. Winds and the weight of the snow could cause tree damage and power outages. The mysterious governing body that name storms have dubbed this one "Stella." ○ Heaviest snowfall is expected in the morning through the afternoon, with rates as much as 2 to 4 inches per hour possible. ○ Slippery roads and visibility of one quarter mile or less at times. Avoid driving. ○ Coastal Flood Watch from 8 a.m. to 12 p.m. Tuesday. 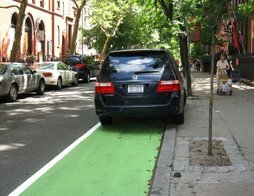 ○ Alternate Side Parking regulations are suspended on Tuesday and Wednesday. Meters remain in effect. Garbage/recycling collections will be suspended once snow operations begin. 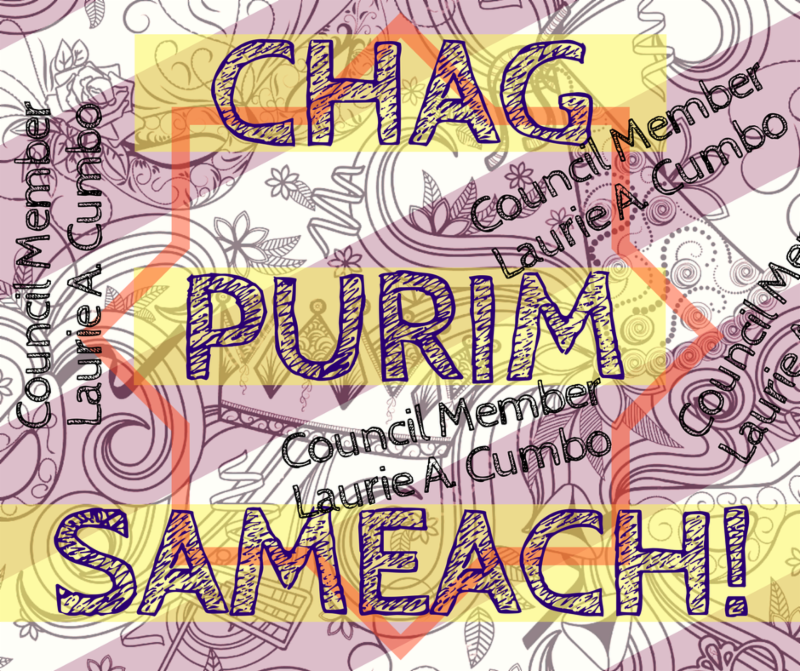 ○ If this thing drags on, check in on housebound neighbors. *According to Wikipedia,a nor'easter is a "macro-scale cyclone. "Nor'easters differ from tropical cyclones in that nor'easters are cold-core low-pressure systems, as opposed to warm ones. 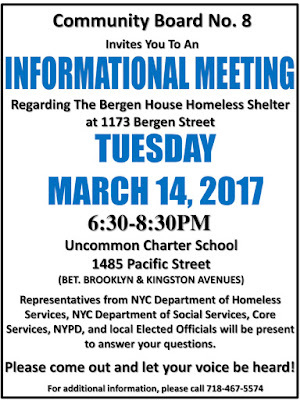 A controversial new shelter for 100+ homeless men is set to open on Bergen Street in Crown Heights soon. 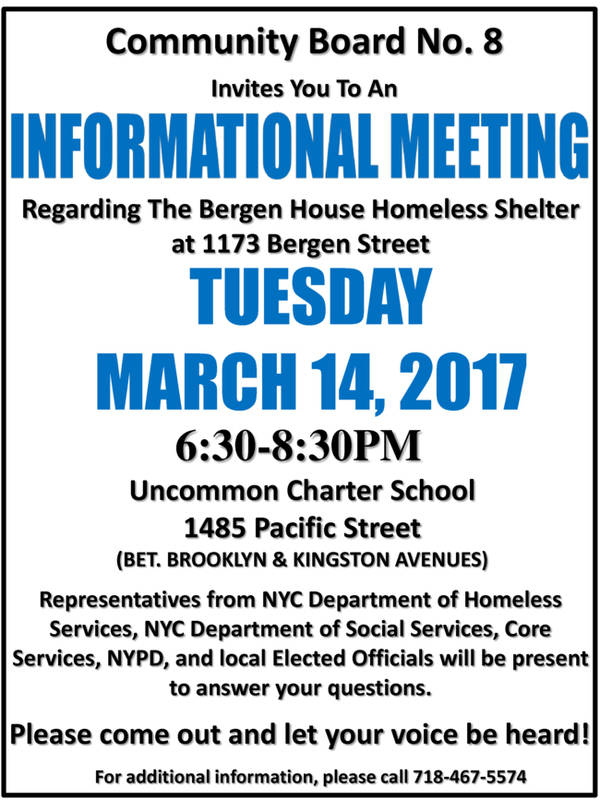 A public meeting about the shelter, at 1173 Bergen Street, is scheduled for Tuesday, March 14, 2017 from 6:30-8:30pm at Uncommon Charter School, located at 1485 Pacific Street, Brooklyn NY 11216, between Brooklyn and Kingston Avenues. Please note, there is an allotted two hour time limit by the school, so arrive on time. 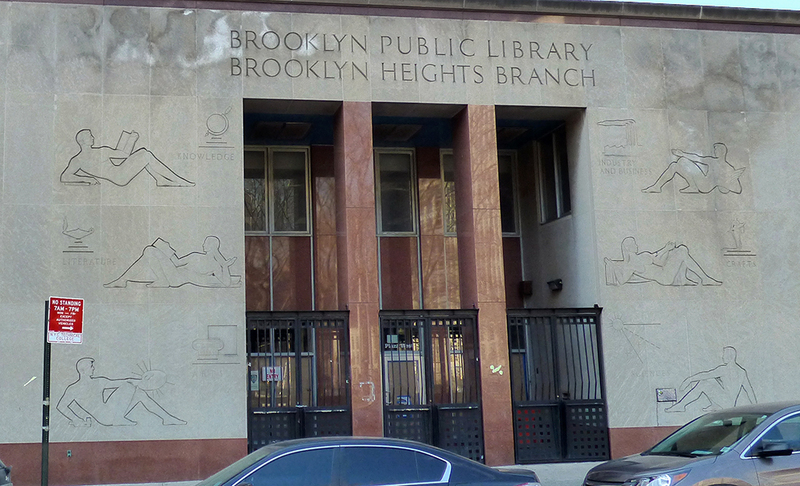 Demolition of the Brooklyn Heights Library will be starting next week. Workers from the demo company began installing fencing around the site at 280 Cadman Plaza West on Thursday. 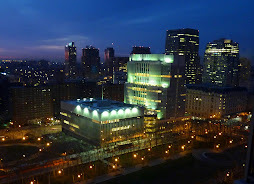 The city’s Department of Buildings (DOB) recently gave its official approval for the demolition. Locals fought the sale of the library to a private developer, Hudson Companies, for years, but in the end, the city and Brooklyn Public Library prevailed. 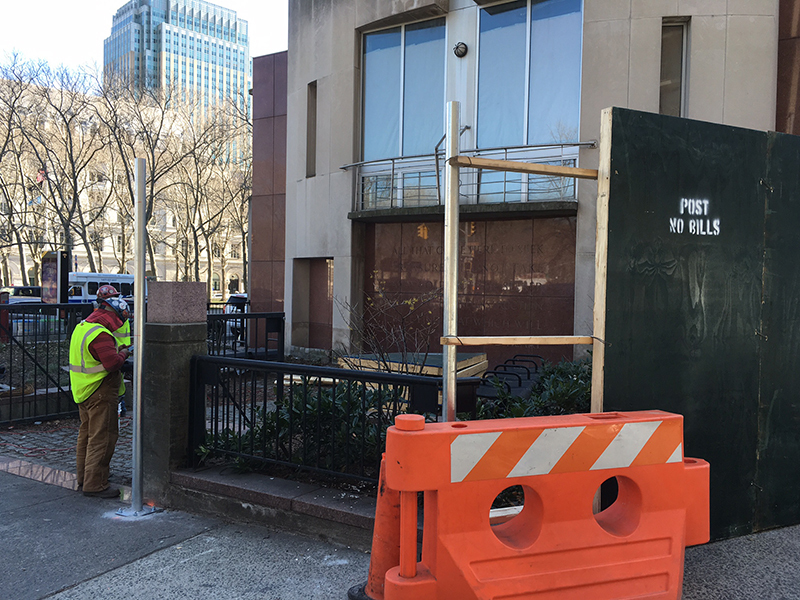 A 36-story luxury residential tower is going up on the site. A newer, somewhat smaller library will be built on the ground floor, a mezzanine and on a lower level. 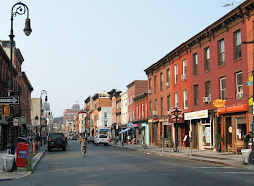 Hudson told the Brooklyn Eagle it has not yet closed on the site, but expects to in the coming weeks. More on this story about the missing kids at ABC. Seen in a subway station: NYC transit technicians do their job and they're proud of it! 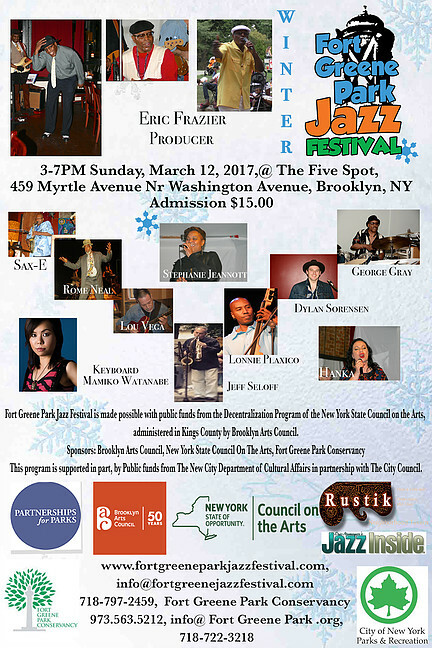 The Fort Greene Park Conservancy and Eric Frazier Productions will present the first-ever Fort Greene Park Winter Jazz Festival, at The Five Spot on March 12. 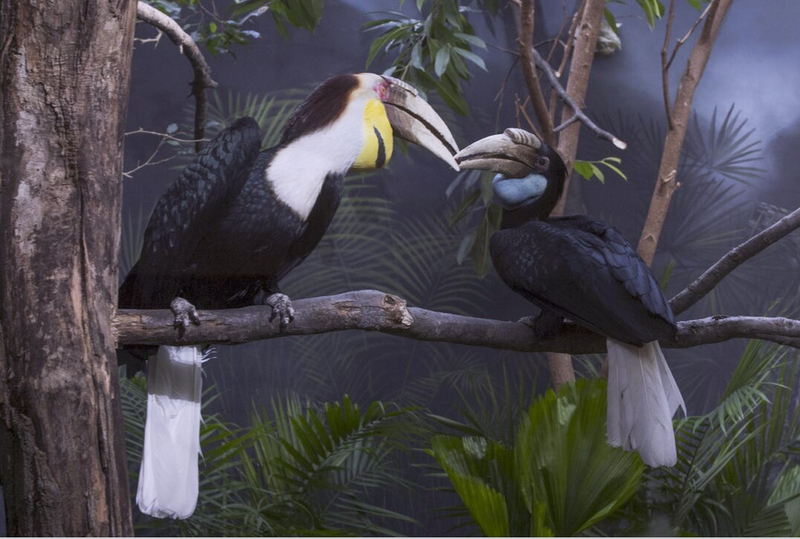 These beautiful wreathed hornbills can now be seen year-round at the Prospect Park Zoo. The zoo tells us that hornbills mate for life, and that the pair see above are bonded together. The new exhibit was created to provide a home "conducive to breeding with hopes that they produce offspring in the future," the zoo says. Prospect Park Zoo staff says it's looking pretty good -- they have already witnessed "courtship behavior" between the two, "with the male making food offerings to the female." Just like humans on a date! A few drinks might speed the process. Just saying. The pair at the Prospect Park Zoo are in their twenties. Wreathed hornbills live to about 40 years in the wild and have been known to live into their 50s in zoos.